We have five office locations that all offer motor vehicle, recording and elections services. 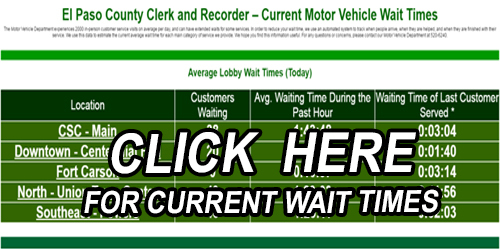 By checking the wait times for motor vehicle service, you can decide which office to visit, or to delay your visit until the wait is shorter. We advise you not to visit at month-end or near a holiday when offices are busiest. Check which office has the least time to wait by clicking the image below. It will link to a screen with current wait times. Hit the branch and a drop-down will show the wait time for each service offered.